What Size Baby Diapers Should I Use? Choosing the right size diaper for your baby can be confusing. Since babies grow at different rates and have different builds, diapers are sized by weight, not age. For most diaper sizes, the weights overlap. If your baby’s weight is in-between sizes, how do you decide which size is better? For example, size 1 baby diapers fit babies 8-14lbs, while size 2 diapers are for babies 12-18lbs. If your baby weighs 12lbs, what size diaper should you use? If you’re not sure, sample a diaper size to make sure the diaper has a snug fit around your baby’s leg. No matter how quickly a diaper absorbs, if there’s a gap where liquid can escape, it will. If you’re experiencing a lot of leaks, you may need to go up or back down a diaper size. Red marks can indicate a diaper size that’s being outgrown, while gaps indicate a diaper size that’s still too large. Incorrect size is the most common reason for leaks and blowouts. How Many Baby Diapers Do I Need? New parents can expect to change more than a thousand diapers just in their baby’s first year. On average, most young babies go through 10 to 12 diapers a day. However, every baby is different. Some babies may need more changes, while others don’t pee or poop as frequently. For the first few weeks, breastfed babies often have a bowel movement after every feeding, while most formula-fed babies have a bowel movement at least once a day. In your baby’s first month, you should expect a minimum of six diaper changes a day (more is fine). 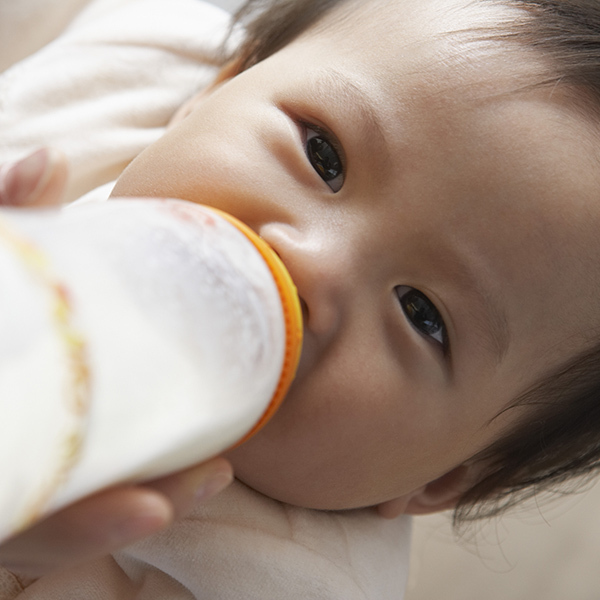 If your baby is peeing fewer than six times a day in the first month, he or she may not be getting enough milk. After the first month, a baby’s bowel movements often slow down. If your breastfed baby goes several days without having a bowel movement and shows no signs of being in pain, this is normally nothing to worry about. Breast milk is rich in all the vitamins and minerals your baby needs, and at times may be completely absorbed and produce very little waste. Bowel movements often slow down for formula-fed babies after the first month as well, and most formula-fed babies have around one bowel movement a day. However, formula is more likely to cause constipation than breast milk. If your formula-fed baby goes several days without a bowel movement, contact your pediatrician. To sample a diaper size, find a retailer who offers samples before making a purchase. TotalHomeCareBaby offers Cuties Baby Diaper samples for sizes 1 through 6. Each baby diaper sample pack includes 2 baby diapers and a $9 coupon off your next order. Tags: baby diaper coupon, Baby Diaper Samples, best baby diaper for leaks, how many baby diapers do I need, how many diapers does a baby go through, how many diapers does a baby need, how much does a baby poop, how to choose the right baby diaper, How to choose the right size baby diaper, TotalHomeCareBaby, TotalHomeCareSupplies, why does my baby's diaper leak . There’s a reason breast milk is the perfect food for your baby: breast milk contains just the right amount of carbohydrates, protein, fat, vitamins and minerals that your baby needs to grow and thrive. Although there are no special foods that will help your body create more milk, the foods you eat while breastfeeding provide all the nutrients that nourish your growing baby. Lactating parents should aim for a healthy, balanced diet that gives your body everything it needs to create rich, quality breast milk for your child. This means that for the most part, you can continue to eat and enjoy the same foods you ate before pregnancy. There are no foods you need to avoid unless they bother your baby. Nutritious foods for your body while breastfeeding include lean proteins, dairy products, fresh fruits and vegetables and whole grain breads and cereals. A lactating parent should aim to drink at least 12 8-ounce glasses of caffeine-free fluid daily. One popular technique is to drink a glass every time you nurse. Doctors strongly recommend avoiding alcohol, especially in large amounts, and limiting the amount of caffeine and sugary drinks you consume. A moderate amount of caffeine (no more than 2-3 cups of coffee daily) will not bother most breastfed babies. Approximately 1% of the caffeine consumed by the nursing parent will pass through your breast milk to the child. Too much caffeine may make it harder for your baby to sleep or cause fussiness. How Do Foods Affect Breastmilk? These signs do not mean that your baby is allergic to your milk, only to something that you are eating. If you cut back on the food that is bothering your baby, or remove it from your diet, the problem usually goes away on its own. More serious symptoms in your baby after breastfeeding may include vomiting, diarrhea, green stools with mucus and/or blood in the stool, rash or hives. Talk to your doctor right away if you notice these symptoms. If your baby ever has difficulty breathing, call 911 or go to the nearest emergency room. A lactating parent’s body requires up to 500 more calories a day to create breast milk. If you follow a diet without any forms of animal protein, or eat very little meat or animal protein, you or your baby may not get enough vitamin B12 while breastfeeding. Your doctor may recommend taking vitamin B12 supplements during this time to protect your and your baby’s health. Signs of low B12 in your baby can include loss of appetite, slow motor development, weak muscles and vomiting. If you are a vegan parent, it is important that you talk to your doctors about your vitamin B12 needs. For more information on breastfeeding, visit the TotalHomeCare Resources Blog, Womenshealth.gov, HealthyChildren.org and La Leche League. Tags: best breastfeeding foods, Best foods to eat while breastfeeding, can a baby be allergic to breastmilk, food allergy signs in a breastfeeding baby, how much caffeine can I have while breastfeeding, signs of food allergy in a baby, TotalHomeCareBaby, totalhomecaresupplies.com, Vegan breastfeeding, what foods are best for breastfeeding, what foods bother babies in breast milk, What to eat when breastfeeding . BPA (Bisphenol A) is a chemical additive in many food and liquid containers that helps to harden plastics, keep bacteria from contaminating foods, and prevent cans from rusting. BPA can be found in many hard plastic items, including baby bottles, water bottles, food containers and other storage containers. It can also be found in the lining inside metal containers that come into contact with foods or beverages, such as food cans and bottle tops. TotalHomeCare is committed to the health of all parents and babies, which is why we carry breastfeeding products that are 100% BPA-free. Ameda has been a hospital-trusted brand for more than 70 years, and the Ameda Purely Yours Double Electric Breast Pump Kit is 100% BPA-free. All accessories that come into contact with breast milk or your baby are also 100% BPA-free, including CustomFit Breast Flanges, Store’N Pour Breast Milk Storage bags and Breast Milk Storage Bottles. In addition, Ameda’s Dual HygieniKit collection system is the only milk collection system approved by the FDA to protect against cross contamination. 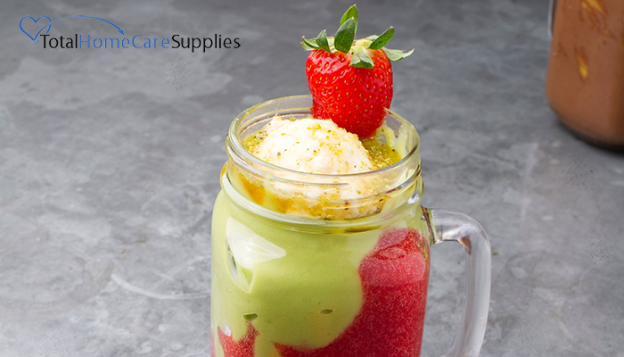 Click here to see all BPA-free breastfeeding supplies at TotalHomeCareBaby. Tags: BPA free baby bottles, BPA free breast milk storage bags, BPA free breast milk storage bottles, BPA free breast pumps, BPA-free baby products, BPA-free breastfeeding supplies, Breastfeeding and Alzheimers, Is BPA bad for babies, TotalHomeCare resources, TotalHomeCareBaby, totalhomecaresupplies.com . Protect your baby’s soft bottom with Quilted Cuties Baby Wipes for Sensitive Skin. These softly textured quilted wipes are made with hypoallergenic, unscented cleansing ingredients designed for sensitive baby skin. Each wipe is pre-moistened with cleanser and enriched with healing aloe and vitamin E to protect against diaper rash and promote skin health. 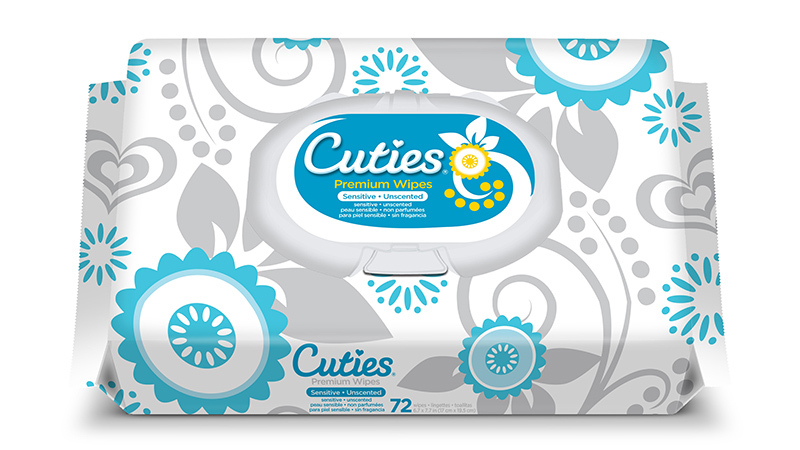 Cuties Baby Wipes are thicker, softer and stronger than retail baby wipes. Cuties Premium Baby Wipes for Sensitive Skin are made from a triple-layer, cotton-enhanced fabric for exceptional performance and comfort. Single Hand Dispensing with a push button flip-top lid gives you easy, one-handed access each and every time. Thick and cushiony, these strong and durable baby wipes can handle the toughest cleanups while remaining gentle on baby’s skin. Wipe dimensions: 6.7in x 7.7in. Tags: Best Baby Wipes, best baby wipes for diaper rash, best baby wipes for sensitive skin, Cuties Baby Wipes, Cuties CR-164131 Baby Wipes, Cuties Premium Baby Wipes for Sensitive Skin, Hypoallergenic baby wipes, Quilted Cuties Baby Wipes Unscented Soft Pack, TotalHomeCareBaby, totalhomecaresupplies.com . Made with premium hypoallergenic materials for your newborn baby, Cuties Baby Diapers for Newborns are as soft as a baby’s bottom. Cuties Newborn Diapers feature an ultra-absorbent, flexible core that locks wetness away to keep your baby dry and comfortable until the next diaper change. Soft, stretchy side and waist panels gently stretch and move with your baby to prevent leaks. Reattaching StretchFit tabs grip over and over, allowing parents to adjust for a secure fit and reattach after checking for wetness. We know how easily delicate baby skin can be irritated by chemicals or other additives. Cuties CR0001 Baby Diapers are 100% ECF (Elemental Chlorine-Free), latex-free, and free from all dyes and perfumes. The extra soft, hypoallergenic liner is enriched with a delicate touch of Aloe and Vitamin E to soothe sensitive baby skin and help keep it healthy. All Cuties Baby Diapers are made in the USA. For parents who prefer a sample, each Cuties Baby Diaper Sample Pack comes with 2 sample diapers and a $9 coupon off your next order. At Total Home Care Baby, shipping is completely free on all orders over $40. Orders come packaged in discreet, unmarked boxes for customer security. With our fast, free shipping and superior customer service, parents can save time and money from the convenience of home. Spend less time at the store, and more time with the little ones you love. Tags: Baby diapers under 10lbs, best newborn baby diapers, best store brand baby diapers, cheap newborn baby diapers, chlorine-free baby diapers, Cuties CR0001 Baby Diapers Size N up to 10lbs, newborn baby diaper coupon, newborn baby diaper samples, newborn baby diapers, newborn diapers free shipping, TotalHomeCareBaby, totalhomecaresupplies.com . Surround your baby with exceptional leakage protection, reliability and ultra-soft comfort with Cuties Baby Diapers. Designed for the active child, Cuties Baby Diapers Size 6 are designed to move with your baby, from crawling to walking and all the way through potty training. A flexible, ultra-absorbent core locks liquid away to keep your baby dry and comfortable. Soft, stretchy side and waist panels move with your active child for a snug, secure fit that prevents leaks, even overnight. Reattaching StretchFit tabs grip over and over like Velcro, so parents can easily check for wetness and adjust for a secure fit. Cuties Baby Diapers are 100% ECF (Elemental Chlorine-Free), latex-free, and free of all dyes and perfumes. The extra soft, hypoallergenic liner is enriched with a touch of healing Aloe and Vitamin E to soothe sensitive baby skin and keep it healthy. All Cuties Baby Diapers are made in the USA. Like to try before you buy? Each Cuties Baby Diaper Sample Pack comes with 2 sample diapers and a $9 coupon off your next order. At TotalHomeCareBaby, shipping is completely free on all orders over $40. Orders come packaged in discreet, unmarked boxes for customer privacy and security. With our fast, free shipping and superior customer service, Total Home Care makes it easy for parents to save time and money from the convenience of home. Tags: baby diaper coupon, Baby Diaper Samples, baby diapers free shipping, baby diapers made in USA, Best baby diapers for active toddlers, best baby diapers for overnight leaks, best store brand baby diapers, Cheap Baby Diapers, chlorine-free baby diapers, CR6001 Cuties Baby Diapers 35+lbs, Cuties CR6001 Baby Diapers Size 6, Size 6 diapers on sale free shipping, TotalHomeCareBaby, totalhomecaresupplies.com . Designed for active babies, Cuties Baby Diapers Size 5 surround your baby with exceptional leakage protection, reliability and ultra-soft comfort. 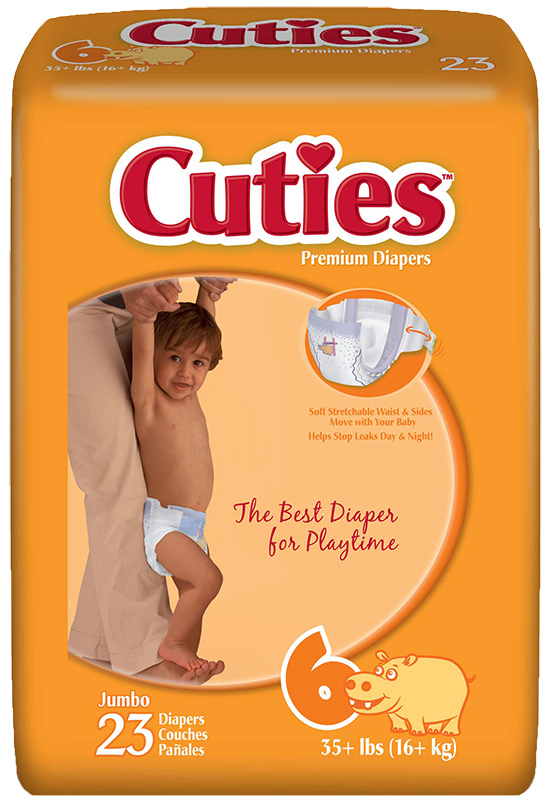 Cuties Baby Diapers are designed to move with your child, from crawling to walking and through potty training. Soft, stretchy waist and side panels move with your baby for a secure, snug fit that prevent leaks. Reattaching StretchFit tabs grip over and over like Velcro, so parents can easily check for wetness and adjust for a secure fit. A flexible, ultra-absorbent core locks liquid away to keep your baby dry and comfortable. We know how important diaper materials are to parents, who want to keep harsh chemicals away from baby skin. 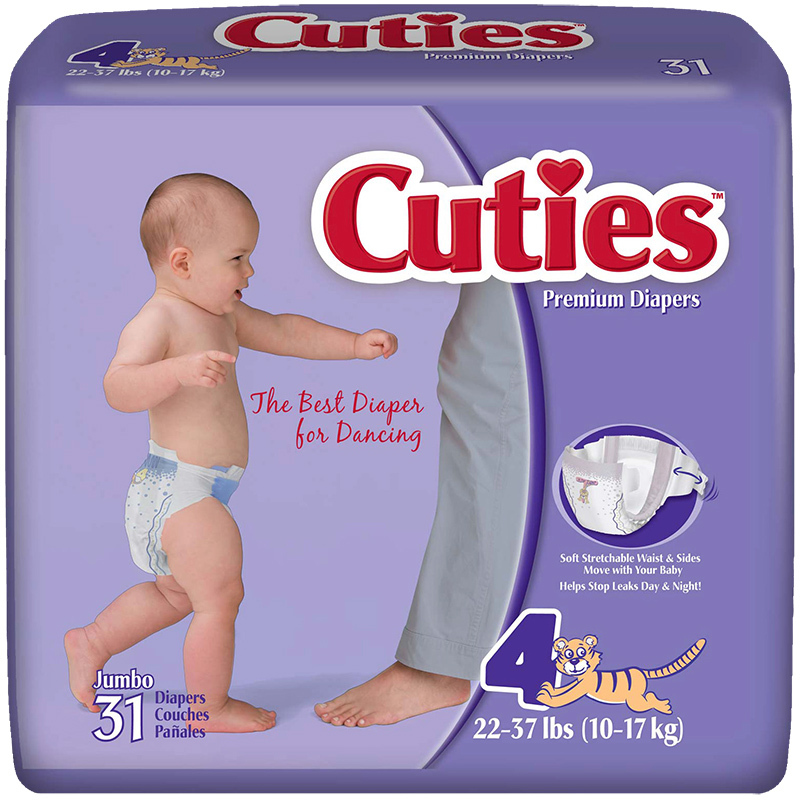 Cuties Baby Diapers Size 5 are designed with premium hypoallergenic materials. All Cuties Diapers are 100% ECF (Elemental Chlorine-Free), latex-free, and free of all dyes and perfumes. The extra soft, hypoallergenic liner is enriched with a touch of healing Aloe and Vitamin E to soothe sensitive skin and keep it healthy. 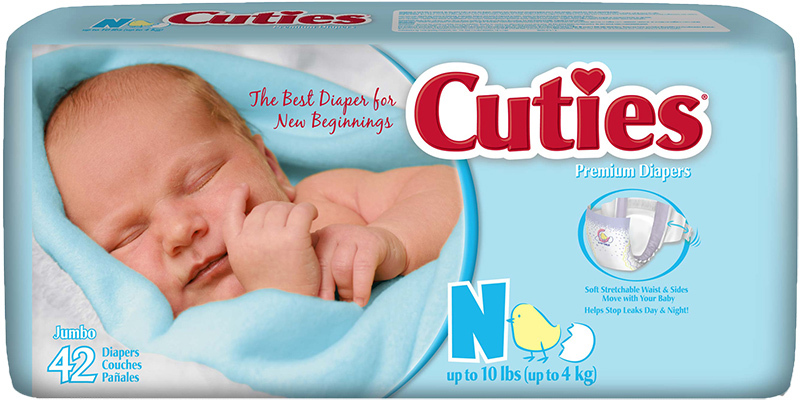 All Cuties Baby Diapers are made in the USA. For those who prefer to try before they buy, each Cuties Baby Diaper Sample Pack comes with 2 sample diapers and a $9 coupon off your next order. At TotalHomeCareBaby, shipping is completely free on all orders over $40. Orders come packaged in discreet, unmarked boxes for customer privacy and security. With our fast, free shipping and superior customer service, Total Home Care makes it easy for parents to save time and money from the convenience of home. Tags: Baby diapers 27+lbs, baby diapers coupon, baby diapers free shipping, baby diapers made in USA, Best baby diapers for active toddlers, best baby diapers for overnight leaks, best store brand baby diapers, chlorine-free baby diapers, Cuties Baby Diapers CR5001 Size 5, Cuties CR5001 Baby Diapers Size 5, TotalHomeCareBaby, totalhomecaresupplies.com . Surround your baby with exceptional leakage protection, reliability and ultra-soft comfort with Cuties Baby Diapers Size 4. Designed for active babies, Cuties Baby Diapers are designed to move with your child, from crawling, to first steps and through potty training. Soft, stretchy side and waist panels move and stretch with your baby for a secure, snug fit that prevent leaks. The ultra-absorbent, flexible core locks wetness away to keep your baby dry and comfortable. Cuties Baby Diapers feature reattaching StretchFit tabs that grip over and over like Velcro, so parents can easily adjust for a secure fit. All Cuties Baby Diapers are made in the USA. Chlorine-free and latex-free, Cuties Baby Diapers Size 4 are designed with premium hypoallergenic materials for your baby. All Cuties Diapers are 100% ECF (Elemental Chlorine-Free), latex-free, and free of all dyes and perfumes. The extra soft, hypoallergenic liner is enriched with a touch of healing botanicals Aloe and Vitamin E to soothe sensitive skin and keep it healthy. Prefer to sample before you buy? Each Cuties Baby Diaper Sample Pack comes with 2 sample diapers and a $9 coupon off your next order. At TotalHomeCareBaby, shipping is completely free on all orders over $40. Orders come packaged in discreet, unmarked boxes for customer privacy and security. With our fast, free shipping and superior customer service, Total Home Care makes it easy for parents to save time and money from the convenience of home. Tags: 22-37lbs, baby diapers made in USA, best baby diapers for leaks, best baby diapers for toddlers, best store brand baby diapers, Cheap Baby Diapers, chlorine-free baby diapers, Cuties Baby Diapers free shipping, Cuties CR4001 Baby Diapers Size 4, hypoallergenic baby diapers, TotalHomeCareBaby, totalhomecaresupplies.com . 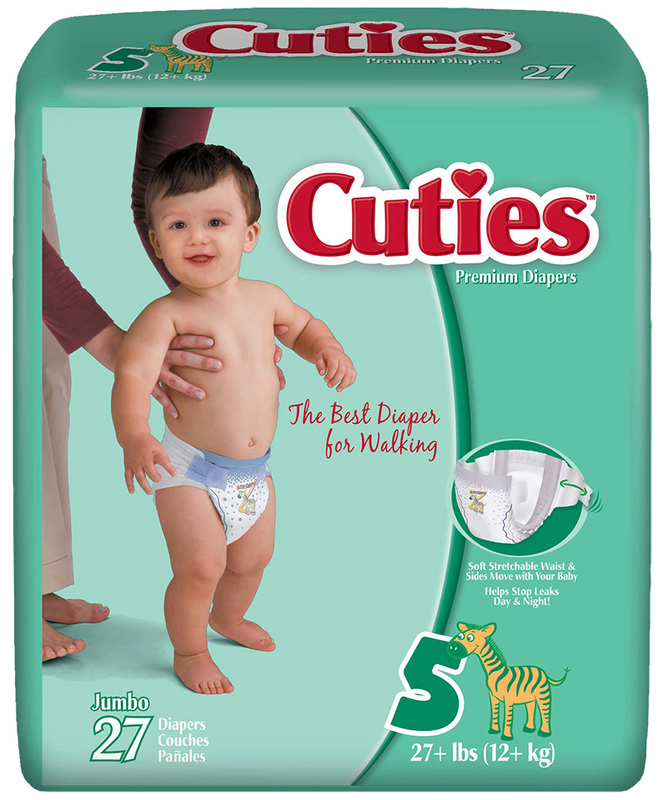 Made in the USA, Cuties Baby Diapers Size 3 are designed with premium hypoallergenic materials for your baby. Cuties CR3001 Baby Diapers Size 3 are as soft as a baby’s bottom. Their soft, stretchy side and waist panels move with your baby for a secure, snug fit that prevent leaks. A flexible, ultra-absorbent core locks wetness away to keep your baby dry and comfortable. Reattaching StretchFit tabs grip over and over like Velcro, so parents can easily adjust for a secure fit. We know diaper materials are important to parents, who want to keep all chemicals away from soft baby skin. Cuties Baby Diapers are 100%ECF (Elemental Chlorine-Free) and latex-free, and free of all dyes and perfumes. The extra soft, hypoallergenic liner is enriched with a touch of Aloe and Vitamin E to soothe and heal sensitive baby skin and keep it healthy. All Cuties Baby Diapers are made in the USA. Tags: baby diaper coupon, baby diapers free shipping, baby diapers made in USA, best baby diapers for leaks, best store brand baby diapers, Cheap Baby Diapers, chlorine-free baby diapers, Cuties CR3001 Baby Diapers size 3 18-28lbs, Size 3 Cuties Baby Diapers on sale, TotalHomeCareBaby, totalhomecaresupplies.com .